The exceptional longevity of the people of Okinawa has baffled scientists for ages. Some have speculated that the secret of the islanders' long life must be in the water they drink. But what exactly is in the water of Okinawa that promotes health and long life? A group of pre-eminent nutrition scientists came together to tackle this puzzle of longevity that could of potential benefit to so many millions. After thousands of experiments, the team identified key substances linked to the long lifespan enjoyed by the Okinawans: organic calcium compounds, which developed naturally over the course of millennia. Initially, scientists replicated the process in a laboratory setting, creating in a few months the organic calcium compounds that takes nature thousands of years to produce. Two years later, our scientists had another major breakthrough. Through a patented new technology, they were able to detect and isolate the same exact organic compound from more than a dozen land-based plants. Today, the number of plants used in production has grown past a hundred. The product, named "EZorb" because of its superior calcium absorption rate, clearly outperforms any other calcium supplement, delivering convincing results for those who suffer with osteoporosis, bone spurs, arthritis, and many other disorders of bones, joints, and muscles. No prescription medications or other calcium supplements even come close to EZorb in terms of improving the health of bones, joints, and muscles. The rate of absorption is the only scientific measure accepted by nutrition professionals for evaluating the efficacy of calcium supplements, and EZorb has set a new industry standard. Its unprecedented 92% calcium absorption rate is up to 20 times higher than that of any other calcium supplement. EZorb Calcium is the only calcium supplement that is able to extend calcium absorption from the duodenum to the entire length of the small intestine. Calcium supplements with low to medium absorption rates will in fact hurt you more than they help you, because unabsorbed calcium interacts with inorganic compounds to form stones. Unabsorbed calcium is one of the major causes of small intestine stones and stones in other organs such as kidneys. The current world record for calcium absorption is EZorb's 92%. You can experience this for yourself by conducting a simple test. We guarantee it! Click here to obtain the step-by-step calcium test instructions. For children and teens: EZorb helps develop strong bones and teeth. For pregnant women and nursing mothers: EZorb gives them the extra calcium they need. For adults and seniors: EZorb promotes healthy bone, joint, and muscle metabolism and speeds up recovery from accident or surgery. Cutting edge technology has positioned EZorb years ahead of the competition. In many respects EZorb Calcium is leading the next wave of new nutrients development. First, EZorb's 92% calcium absorption rate has created a new industry standard, because most calcium supplements available today are absorbed only at rates of 5% - 25%. Second, calcium absorption is not the end of the story. Most bone, joint and muscle diseases are caused by weakened bone, joint and muscle metabolism. The only way to correct all those diseases is to raise bone, joint and muscle metabolism. EZorb does exactly that. For instance, EZorb stimulates osteoblast (bone forming cell) activities to make sure calcium is converted to bone mass. That's why EZorb is so powerful against osteoporosis. EZorb encourages development of joint collagen and synovial fluid, so that joint cartilage is repaired and joints are kept lubricated. 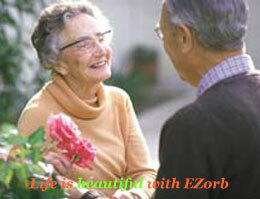 EZorb is unquestionably the best solution for osteoarthritis, rheumatoid arthritis and many other types of arthritis. EZorb has also been proven to work extremely well against bone spurs and fibromyalgia. Moreover, EZorb Calcium does not form magma precipitation (stones) or stomach disorders, unlike many of the most popular calcium available on the market today. Last but not the least: it works! Click here to read what customers are saying about EZorb. What's in the EZorb Calcium? Unlike traditional calcium compounds such as calcium carbonate (from coral reef, rocks, seaweed, oyster shells), calcium citrate or calcium gluconate, EZorb is calcium aspartate anhydrous (CalAA), an organic compound extracted from land-based plants, using Elixir Industry's proprietary technology. >> Is Arthritis (OA/RA) Curable? >> Will EZorb Calcium Dissolve Bone Spurs? Our medical professionals are available 7 days a week to answer your questions. The free monthly EZorb Newsletter is a good source for success stories and latest news. Click here to sign up. Check out the clinical studies if you are a medical professional and would like to read more about EZorb.